There is consensus on the need to create jobs—Congress promises one crore jobs and the BJP promises to skill and employ an equal number. The American composer and author, Oscar Levant, better known for his caustic comments, once said of a politician, “He’ll double-cross that bridge when he comes to it.”It’s the season of promises in Karnataka and the Congress and the BJP have both unveiled their manifestos, titled ‘Progress with Congress’ and ‘Namma Karnatakakke Namma Vachana’, respectively. If gross verbiage of grand political promises made in the manifestos of political parties were to be factors, the gross state domestic product of Karnataka is headed for exponential growth. There is consensus on the need to create jobs—Congress promises one crore jobs and the BJP promises to skill and employ an equal number. As of now there is the intent. The how part is the bridge left to be crossed when elected. One of the essential conditions of politics is the ability to make promises and the ability to “double-cross that bridge” is a necessary qualification for politicians. 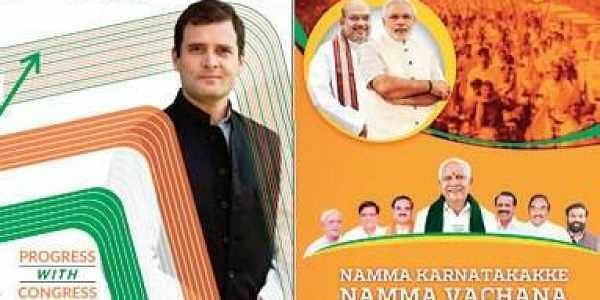 The good news is that both parties have made a strenuous effort to reach their audiences—the Congress has released manifestos for 30 districts, four regions and one 52-page document, while the BJP has produced a 64-page charter of promises. What is worrying is the trajectory of the promises being made—the loan waivers, pilgrimage subsidies, zero to one per cent loans, grants, gold, phones and more. The underlying theme promotes the expansion of the nanny state and enlargement of the entitlement economy—the scent of sop politics, of profligacy and populism is unmistakable. The Congress manifesto promises to promote the expansion of the IT sector from $60 billion to $300 billion and biotech to $50 billion. There is no law precluding ambition and the idea of promoting centres of excellence in AI, block chain, big data analytics, robotics, and machine learning are all welcome. But the ideas that follow seem problematic at the least. The manifesto proposes to incentivise international companies to set up shop and to this end will offer a subsidy of “approximately Rs 1 crore” split into a grant of Rs 25 lakh and a soft loan of Rs 75 lakh at 6 per cent”. The need to provide a subsidy is inexplicable given that Bengaluru is the hub of the largest number of start-ups working on innovation across sectors with funding flowing from venture capital and private equity firms. It is not clear as to which sector suffers from lack of funding and what will be the quantum of funds made available for how many companies. Then there is the issue of enlargement of the entitlement economy. One of the serious issues confronting the political economy is the viability of farming. That loan waivers are at best saline drips and agriculture requires deep-rooted reforms has been stated often enough. But loan waivers continue to be in vogue. Another intriguing idea finds place in the BJP’s manifesto. Under the Negilayogi Yojane, the party proposes to provide direct income support of Rs 10,000 to 20 lakh dry land small and marginal farmers. Perhaps it is meant to be viability gap funding for small farmers or perhaps a test-run of an abridged version of a basic income scheme for rural India? The idea is not spelt out. And then there is a curious scheme to “Enable 1,000 farmers to travel to countries like Israel and China every year to study best practices in agriculture under the “Chief Minister’s Fellowship for Agriculture”. The idea is, of course, not unique. The Telangana government has been proposing to send experts and farmers to Israel, too. The question is about outcomes. Why not deploy the resources—money and manpower—to install the concepts by inviting the Israeli experts to help set up trial farms to create a demonstration effect? The compensatory feature about both the manifestos is that they have covered every sixth degree of separation that matters electorally. The disappointing feature is that much of it is a pilgrimage to the policy library stacked with advocacy of the ‘motherhood and apple pie’ kind. A serious water crisis is haunting Karnataka—particularly Bengaluru. How is it being addressed? The Congress says “INC will ensure maximum utilisation of irrigation and drinking water supplies of Cauvery, Krishna, Godavari, Bheema and other reservoirs.” The BJP promises a “Separate ministry to plan and implement projects to ensure clean drinking water using river and surface water for every household in the state.” Lakes are dying or catching fire. Congress says, “Mission Mode Programme will be launched to cleanse and rejuvenate 192 lakes in Bengaluru”, and the BJP says it will launch “Mission Kalyani” to rejuvenate all tanks and lakes in the state. Karnataka is no ordinary state. It is home to India’s innovators and techies. One would expect some radical ideas—for instance, energy-neutral wastewater treatment with biological hydrolysis, a new cropping pattern and/or a switch to tech-enabled drip irrigation, a live-wire idea for creating an e-mart for perishables et al. Surely, the parties could have thrown up a grand challenge for solutions. Democracy needs more than competitive sloganeering; it needs competitive ideas for governance.